New England Biolabs (NEB) and Integrated Genomics, Inc. (IG) have completed the DNA sequence and preliminary annotation of the genome of Wolbachia from Brugia malayi. The work has been published in PLOS Biology [Foster J, Ganatra M, Kamal I, Ware J, Makarova K, et al. 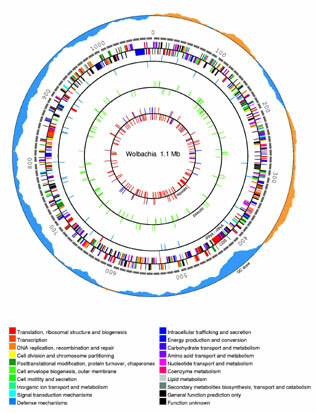 (2005) The Wolbachia Genome of Brugia malayi: Endosymbiont Evolution within a Human Pathogenic Nematode. PLoS Biol 3(4): e121.] This data is accessible for database searching on this site. ©2002 © 2003 © 2004 © 2005 New England Biolabs. All rights reserved.